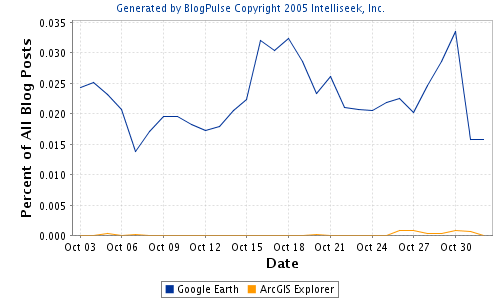 As tired as some are of all the ArcGIS Explorer noise they have been hearing, it isn’t even a dent into the amount of Google Earth posts. This just shows that ESRI doesn’t have a hill to climb, but a mountain. In fact beyond a few blogs in our little GIS circle, not a peep has shown up on more mainstream blogs and sites. Most of the non-stop spin we saw was just repeating of the same stories. Matt Waite saw it and called it the “GIS geek world echo chamber” and what a small echo chamber it is.